Injoy Lure Coursing Equipment - When you want the best, buy INJOY Lure Coursing Equipment. In business making outstanding equipment since 1977. - INJOY LURE COURSING EQUIPMENT....When you want the best, buy INJOY! This lure machine is not for everyone, but there is simply no better way to play train puppies or retrain the experienced hound that is now anticipating and cutting the course. This 12 volt motor runs at the same speed and torque in both directions of operation and has two ball bearings (front and rear) installed. You can quickly and conveniently reverse direction of the lure using the handheld control box. The stand is constructed of 1/2” black high density plastic and supplied complete with our "new" 12 volt TB1225 motor (2.5 hp), with solenoid, two battery cables, voltmeter, 8” spikes and a switch with 15’ cord. This motor is being exclusively manufactured for INJOY and has four field coils (the old Ford starter motor had two) and ball bearings front and rear. This 12 volt motor produces 2.5 HP (approx. the same as the old Ford starter motor) and is being manufactured exclusively for INJOY and to INJOY specifications. It is designed to provide a more reliable and durable choice when compared with the old Ford starter motor. The motor has a four hole mounting plate with a six inch long, 5/8 inch diameter shaft. To provide more torque, it has four field coils (the Ford Starter has two) and the shaft turns on two ball bearings. This is a high quality motor manufactured with lure coursing requirements and performance in mind. A new and improved hub design now allows the wheel to be installed at the end of the motor shaft using the supplied through bolt or moved in closer to the lure stand and fixed in place using a set screw onto a flat spot on the motor shaft. 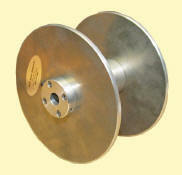 This is a “pie pan” style wheel and is constructed of custom spun stainless steel sides. The geometry of the string groove is such that it will perform well with a minimum amount of line tension (8 to 12 lbs.). Operating instructions for the S-S Continuous Loop Wheel. 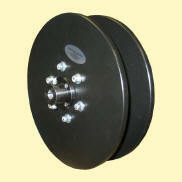 A 12 inch diameter wheel with a solid 4 inch diameter core that will hold approximately 1200 yards of line. The wheel is constructed of a high density plastic which is at least twice as strong as hardwood plywood. 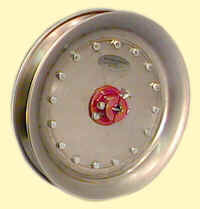 This wheel is intended for Jack Russell Terrier straight racing and is constructed of high grade aluminum with 7 inch diameter side plates and a 2 inch diameter core with a 3-1/2 inch width between side plates. The 2 inch core will give a lure speed of approximately one half that given by the STD Take Up Wheel.